8 ounces of sports drink (like Gatorade or Tailwind reconstituted at full strength) has about 10-15 grams of carbohydrate. An ounce worth of pretzels (just about a 100-calorie pack) has around 20 grams of carbs. Test out products one at a time on the run to see how you like them in terms of taste, fueling and how they impact your gut. If you try two different gels, or a gel and a drink and have GI distress, you won’t know whether the gel, the drink, or the combo caused the issue. Once you’ve confirmed you like a product, then you may choose to test mixing it with other products to meet your race day needs. For example, to reach 50 grams per hour, you may try one gel + 12 ounces of sports drink over an hour; or one gel + a snacking on bag of jelly beans over an hour. There’s no need to consume as much carbohydrate on your training runs as you will on race day, and in fact, by going out with less fuel during training, you will adapt to becoming a better fat burner, which is a good thing. However, choose one or two of your longer runs as a fueling dress rehearsal: Eat a simple carb-rich breakfast 2-3 hours before your run, take your first bite of fuel early in the run, and test your race day fueling strategy. Lauren is a certified Health Coach who helps busy Baltimoreans articulate their health + wellness goals, and make measurable, sustainable diet and lifestyle changes for lasting transformation. 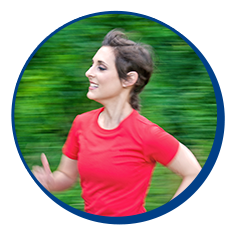 Though she would never be described as athletic in her youth, Lauren started running as an adult, begrudgingly at first, until she discovered she actually enjoyed it. A10-time marathoner, 4-time ultra-marathoner and Boston Marathon qualifier, you’ll frequently find Lauren running on roads and trails with her husband John and dog Osita.